t was a long time ago that the Emperor of Russia, Nicolas I., made up his mind that he wanted a railroad between Moscow and St. Petersburg. He meant to have it one of the best in the world. So he called an officer into his council chamber and said: "Now take plenty of time to look about in the different countries, have all the men you want to help you, but find me, somewhere, an engineer that will lay out a perfect railroad line." Men appointed by this colonel traveled some months. They visited many cities, wrote letters, and asked advice. Then the colonel went back to the emperor and said: "The man you need to do this piece of work lives in the United States of America." "What's his name?" asked Nicolas. "He is Major George Washington Whistler. He is one of the founders of the city in which he lives, Lowell, Massachusetts. He is a distinguished army officer and a fine engineer." "He is named for a great officer," answered Nicolas, remembering our General Washington, and he dispatched a letter to the Lowell engineer. The major made haste to start for Russia, because the honor was great, and the payment would be generous. He left his boys and his wife behind, because he did not know just how comfortable he could make them in the far-off country, but he told the boys to be good and to mind their mother. These boys were named James McNeill, William, and Charles. Their mother was a fine woman, but sometimes they wished she would not be quite so strict. She used to say on Saturday afternoons: "Come, boys, empty your pockets and gather up your toys; we will put the knives and marbles away and get ready for Sunday." All day Sunday they were not allowed to read any book but the Bible. But James liked the stories he found there, and when he was only nine could say almost half the Bible by heart. James was the oldest in the family. He was born in Lowell and was such a cunning baby that everybody wanted his picture. One of his uncles, who loved him dearly, used to say: "It's enough to make Sir Joshua Reynolds (this was a great English painter, who had died years before) come out of his grave to paint Jimmie asleep!" Jimmie had delicate features and long, silky, brown curls that hung about his face. In among these was one white lock that dropped straight down over his forehead. This looked like a tiny feather. More than all his playthings he liked a pencil and paper. From the time he could scribble at all he drew pictures of everybody and everything in sight. These pictures were very good, and when he was large enough to go to school the other children were apt to ask him to make animals and birds for them on the blackboard. Major Whistler soon sent for his family to join him in Russia. It was a long, hard voyage there, and poor little Charlie died on the way. The two other boys were better sailors and were as well as could be when they met their father. They did enjoy the strange sights in St. Petersburg! They were not long in getting acquainted with the little Russian children or in learning the language. They went skating, dressed in handsome furs; they learned the folk and fancy dances, joined in the winter sports, and voted Russia a fine country. Still their parents did not let them forget they were little Americans. The climate did not agree with James, and every time he caught cold he had touches of rheumatism, so that often he had to stay in the house and have his feet put in hot water. Instead of making a fuss about this, he used to call for pencil and paper and practise drawing feet until he could make very perfect ones. Major Whistler sent him to the Art Academy in St. Petersburg, where he was praised by his teachers. That old, tiresome rheumatism kept bothering him, and by and by he had a long rheumatic fever. He was a dear, patient boy, however, and afterwards declared he was almost glad he had it because some one who pitied the small invalid sent him a book of Hogarth's engravings. I want you to be sure and remember about this gentleness and patience, because when he was older people often accused him of being cross and rude. But at this time I am sure no one could have been nicer. James was very careful of his mother, too. One evening she had taken the boys in a carriage to see a big illumination. Bands were playing and rockets flying. The horses next their carriage were frightened, and reared and plunged as if they would hit the Whistler party. James shoved his mother down on the seat behind him, and standing in front of her, beat the horses back from them. He always was as polite to her as if she were the emperor's wife. The major worked too hard on the great railway and died before James was fifteen. The emperor was fond of the two boys and wanted them to stay on in Russia and be trained in the school for pages of the Court. But their mother said they must grow up in America and hurried back to her own land. She did not have much money to spend but thought James should go to West Point to get the military training his father had had. At this academy he found he did not like to draw maps and forts nearly as well as he did human figures and faces. Once, when he had been sent to Washington to draw maps for the Coast Survey, he forgot what he was about and filled up the nice, white margins with pert little dancing folks. He was well scolded for this, I can tell you. James was a tall, handsome young fellow at this time, and liked to go about to dancing-parties in the evening. He earned very little making maps and could not afford to buy the real, narrow-tailed coat which was proper. So he used to take his frock coat that he wore all day and pin it back to look like a dress coat and start off for big balls, where nobody was much shocked, because he was always doing droll things and was so lively that he was welcome in any dress. In Paris strangers used to ask who the young artist was who had the snow-white lock among his black curls, for the brown curls had grown as black as jet, and the map-drawing had grown so tiresome that James had given up West Point and settled down to painting and etching in Paris. He had decided that there was nothing in the world which suited him but the life of an artist. He worked quite steadily and people began to say: "I think young Whistler is going to do great things some day." But suddenly he packed up and went to London. In this city he was praised even more, but he did not sell enough pictures to pay his bills, and once, when he had kept men waiting a long time for money that he owed them, officers came and took everything away but his pictures. The room looked so bare and homely that Whistler painted a very good imitation of furniture round the walls of his room. So good, in fact, that a rich man who came to look at the pictures sat down in one of the imitation chairs and found himself on the floor. It was fortunate that James could go a long time without food, for it took nearly all he could earn from his pictures to buy paint and canvas for others. I dare say that quite often when it was said: "James McNeill Whistler is growing rude and cross," the real truth of the matter was that James McNeill Whistler was hungry and worried. However, he began to make money at last, and just as life seemed bright, an art critic, Mr. John Ruskin, declared that the Whistler pictures, which were being bought at big prices, were poor--very poor! Mr. Ruskin spoke, and what was worse, printed his opinion. "I never expected," he wrote, "to hear a coxcomb ask two hundred guineas for flinging a pot of paint in the public's face!" Well, it did not look for a while as if there was any more good luck in the world for James Whistler. He did not lose any time in getting a lawyer to sue Mr. Ruskin for spoiling the sale of his pictures. There was a trial in London, and the court-room was crowded. Some were there because they already owned Whistler pictures and wanted to find out if they had paid good money for bad pictures; others because they were warm friends of the artist or the critic; but even more men and women went to hear the sharp questions of the lawyers and the clever answers of Ruskin and Whistler. Whistler won the case. When the judge awarded one farthing for damages (this is only a quarter of a cent in our money! ), Whistler laughed and hung the English farthing on his watch-chain for a charm. Mr. Ruskin had to pay the costs of the trial, which had mounted up to nineteen hundred dollars. Some of his friends insisted on raising that sum for him. One of them said it was worth nineteen hundred dollars to have heard the talk that went on in the court-room. Later, Mr. Whistler received much more than two hundred guineas for a single picture. Two famous ones, of which we often see prints, are "Portrait of my Mother" and the Scotch writer, "Carlyle." 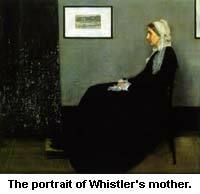 James Whistler's mother lived to be an old woman, as one can guess from the picture, and her son loved her just as dearly as he did when he beat the prancing horses away from her, in Russia. The French nation bought this portrait, and it hangs in the Luxembourg Museum, Paris. The Scotch people wanted to own the portrait of Carlyle, and the city of Glasgow was glad to pay five thousand dollars for it. Mr. Whistler married a woman who was herself an artist, and she was very proud of him. "The Duet", one of his pictures, shows his wife and her sister at the piano. Two portraits by this American artist hang in the Boston Museum of Fine Arts, but most of them are owned in England. James Whistler was always kind to young artists and liked to have them sit by him while he worked. They were very proud to be noticed by him, for long before he died he had received all kinds of honors and medals from foreign academies; and France, Germany, and Italy made him an Officer of the Legion of Honor, a Commander, and a Chevalier. He loved art so well that he made water-colors, pastels, etchings, and lithographs, as well as oil paintings. He did not get his fame without much hard work. You remember how many times he copied his own foot when he was a child. Well, he was just as patient and thorough when he was older. For a long time he made a practice of drawing a picture of himself every night before he went to bed. He traveled a great deal, painting views in many countries and studying the pictures of other artists. But Hogarth was his favorite, and it is interesting to know that James McNeill Whistler lies buried very near Hogarth, in London, for he had thought him a model ever since his boyhood days in St. Petersburg.